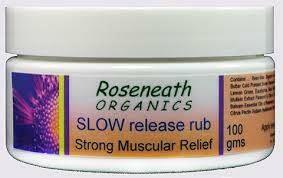 Roseneath Organics Slow Release Rub is a natural anti-inflammatory and pain relief rub made right here in South Australia. The rub contains natural anti-inflammatory ingredients which may assist in the healing of sprains, bruises, and contusions. The ingredients in the rub encourage local circulation to injury sites which in turn can result in faster healing and deep tissue repair.As little as one application of Slow Release Rub can provide up to 8 hours of continuous pain relief, making it ideal for achey legs, sore muscles and joints. The rub comes in three sizes, 500g, 100g and a trial size of 20g. All sizes are available for purchase from any of Core Physio’s Adelaide locations and if requested can be used by our physios within a treatment to test out the effects.